The same poll shows that 49 percent of respondents think the president’s proposal to “temporarily forbid asylum to all those who cross the southern border of the United States illegally” is a good idea. The Daily Mail noted that the president has threatened to permanently close the border with Mexico. The Daily Mail cited a report from San Diego Sector Border Control Chief patrol agent Rodney Scott that migrants immediately began throwing “rocks and debris” at his agents. That was apparently when the tear gas was used by agents in an effort to protect themselves and the border. According to the Rasmussen survey, 41 percent of respondents do not believe the caravan poses a threat. Thirty-seven percent disagree with the proposal to temporarily deny asylum. The survey breaks down along political lines. Eighty-one percent of Republicans think the migrants trying to enter the U.S. illegally do pose a threat to public health and national security, while 65 percent of Democrats do not agree. 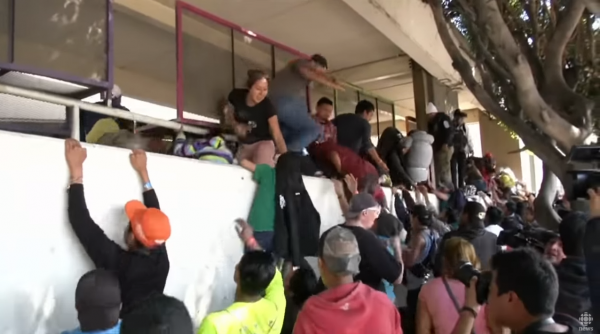 On Sunday there as what Fox News described as “chaos” when hundreds of migrants rushed past Mexican riot police just across the border from San Ysidro, Calif. The situation is being described as a “crisis” in some news reports. Others are calling it an “invasion.”The same poll shows that 49 percent of respondents think the president’s proposal to “temporarily forbid asylum to all those who cross the southern border of the United States illegally” is a good idea.